While there are literally hundreds of photographs of white-coated male researchers making or using scientific instruments, there are almost none of women doing comparable things. Rather, women are invariably passive or admiring observers. In other words, females are shown dominated by rather than in charge of technology. Science Service images were typical of those presented by other contemporary media, save for the occasional movie about Madame Curie. None of this means, of course, that women did not play active roles in science and technology over the last two centuries. On the contrary, at the Lemelson Center we have uncovered ample evidence of significant female contributions. But, given the skewed nature of the visual record, we have had to work very hard to find this evidence. While image isn’t everything, it counts for a lot in today’s visual culture. After giving a call over to [Smithsonian Institution Archives], I found out that when the Science Service records were transferred to the Smithsonian during the 1970s (over 500 boxes! ), records were distributed throughout SI depending on their relevancy to a museum’s expertise and mission. So, for example, any material dealing with the history electrical innovation and invention went to the Division of Electricity and Modern Physics at what was then named the National Museum of History and Technology (now NMAH). Other parts of the Science Service records followed, going to other NMAH curatorial divisions, the Smithsonian’s National Air and Space Museum, National Museum of Natural History, National Portrait Gallery, and the Smithsonian Institution Archives. The women in the photos at the Lemelson Center indeed look more like early 20th century Vanna White’s then the women in the SIA records. Throughout March 2009, SIA will post groups of photographs showing women scientists and engineers at work; women trained in science and engineering who worked outside the laboratory as librarians, writers, political activists, or in other areas where their work informed or was informed by science; family research collaborators who assisted their scientist husbands and fathers; and several images for which we have little descriptive information to which we invite you to contribute! There are images of physcist Katharine Burr Bodgett (1989-1979), botanist Mary Agnes Chase (1869-1963), herpetologist Doris Mable Cochran (1898-1968), neuroanatomist Elizabeth Caroline Crosby (1888-1983), astronomer Annie Jump Cannon (1863-1941), biologist Muriel A. Case (1901-1981), geneticist Estrella Eleanor Carothers (1883-1957), biochemist Mary Van Renssalaer Buell (1893-1969), physiologist Elizabeth M. Bright (at Harvard Medical School in the 1920s), and physicist Maria Goeppert-Meyer dressed to the nines and being escorted by King Gustav Adolf of Sweden at the 1963 Nobel Prize banquet (she looks understandably a bit stunned). As the description of the set suggests, not every photo is of a scientist, there's also test pilot Jacqueline Cochran, nurse Josephine Fountain (inventor of the "Direct Suction Tracheotomy Tube"), and science journalist Marjorie MacDill Breit, among many others. It's so nice to see that the set is not at all dominated by the most well-known women scientists, like Marie Curie. It is interesting, though, that few of the women are wearing white lab coats or other "typical" laboratory or field gear. I've seen scientists having their photos taken for publicity shots and I know the photographer often ends up making the setting quite artificial (PI in pristine lab coat holding up a sequencing gel or other film while artfully arranged reagent bottles sparkle in the background seemed to be a popular one), so it's hard to know how representative they are of what these women usually dressed when they were working. Most look like they are enjoying themselves, though, and I think that's all natural. Here are a few I especially liked - some as much for their descriptions as the images. Description: Wanda Margarite Kirkbride (b. 1895) was completing graduate work in chemistry at Columbia University when she met and married Clifford Harrison Farr. When Clifford died in 1928, while they were living in St. Louis, Wanda Farr carried on with her research and eventually became Director of the Cellulose Laboratories at the Boyce Thompson Institute for Plant Research in Yonkers, New York, doing pioneering work on cellulose synthesis and plastids. Description: In 1946, when this photograph was taken, Mary Blade was the only woman on the Cooper Union engineering faculty (where she initially taught drawing, mathematics and design) and one of few women on any engineering faculty in the United States. Blade was an avid and accomplished mountain climber. Description: Ichthyologist Cornelia Maria Clapp (1849-1934) earned both the first (Syracuse, 1889) and second (Chicago, 1896) biology doctorates awarded to women in the United States. She spent most of her career as professor of biology at Mount Holyoke College and, every summer, continued her research on fish development at the Marine Biological Laboratory at Woods Hole. Go browse the whole set. 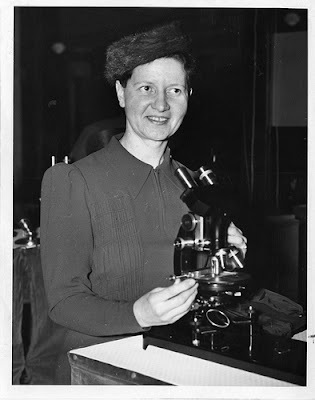 And also check out the posts at The Bigger Picture by a couple of the archivists who helped assemble the Flickr collection: Mary Markey on "Adventures in the Morgue" and Ellen Alers on "Formidable: Women in Science". This is a great post. You should include it in the Ada Lovelace day pledge. I have saved it for the great names and links that will be handy for the future Lovelace days! But I think the folks involved with this blog swarm would really like it too. Susan: glad you like it. SSP: I haven't heard of any play like that, at least for kids. Maybe I can ask my blog readers? Mary: I signed up for the pledge already, but this wasn't going to be my post. It's nice that there are so many possible women to write about! Thanks for the round up of pictures. To think that they actually did have pictures of actual women scientists but then never used for media purposes says a lot about what the media back then thought would sit right the the common social psyche. They must have thought that " why not just avoid showing pictures of smart scientists lest the poor men feel threatened "
I absolutely love your blog and you know that i have you on my blogroll on my Ecology blog. What they show on tv is what influences the next generation of girl children to aspire to. If 'smart' is potrayed as 'cool', more young women will try to go to college and get a job. If cheerleading alone is potrayed as coool , we will end up with a whole generation of financially dependant stay at home ex cheerleader women regretting that they never finished college.